Blackpool has always held a place dear to my heart. The childhood town to my Dad, it's always been a place that I have fond memories of - most of them including being spoilt as a child by my Grandma, Aunt & Uncle. But because visits were often short and sweet, and very much preoccupied by spending time with relatives, I've not done much of the touristy bits. So when I was approached by Visit Blackpool with the opportunity to spend the day there and focus on some of Blackpool's highlights, it was a no brainer. Being based in Manchester and not owning a car means that public transport is a huge deal. But after countless visits, the trains are the perfect trip - taking around 1hr30 from Manchester Piccadilly to Blackpool North. And within Blackpool - if you're blessed with good weather, most places such as Pleasure Beach and the Tower are walkable. Because we were starting the day with Pleasure Beach, my brother and I caught the train into Blackpool Pleasure Beach station - changing at Preston. And we had a blast. As the train pulled into the station, the heavens opened and we were "blessed" with the hugest rain storm - only for it to clear right in time for the park's opening. I've only been to Pleasure Beach once before, but quite honestly, I was so young, I don't have much memory of it (aside from a glorious picture from the Log Flume). But it was wonderful. Due to the earlier rainstorm, the park was quite empty which meant we were able to hit all the rides (including the Big One). It was the perfect morning and we were buzzing from the adrenaline! The park is ideal for anyone of all ages as it has 'big' rides for the adults and Nickelodeon world for the littler ones - it's the perfect day out. James and I had the benefit of a Resort Pass which is a ticket that allows you to visit multiple Blackpool Attractions and after the whirlwind excitement of Pleasure Beach, we opted for a quieter afternoon at Blackpool Sealife. I'm a huge fan of Aquariums as there's something about them that is incredibly tranquil, so the prospect of visiting one was right up my street. The Aquarium isn't quite as big as the London equivalent but it is still home to a vast array of marine creatures from clown fish aka Nemo to Dory fish to huge 7ft Nursing Sharks. I'd highly recommend fitting in the Shark Feed as it meant you got a great view of all the sharks (even the ones who are often nocturnal). 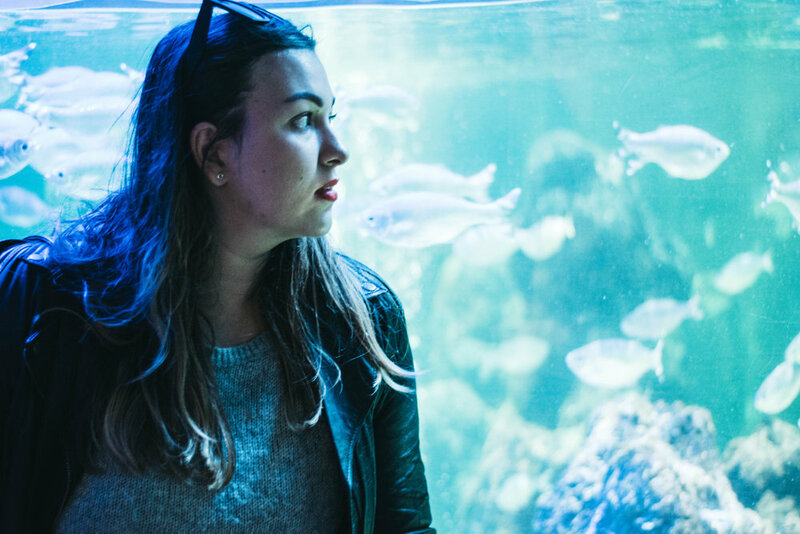 The aquarium is made up of different zones - each representing a different ecosystem which means you really get to see them all. Personal favourites included the Coral Reef part and the StingRays. Again, ideal for both big adult-kids and littles. Considering we were at Pleasure Beach for opening time, we fitted in a heck of a lot and were so glad we did! It was a lovely change to get to see some of the tourist attractions that Blackpool has to offer and it definitely added a new dimension to the place. If you are looking into planning a weekend holiday or a day trip, I'd highly recommend Blackpool as there's something for everyone. Have you been to Blackpool? What did you see when you were there? Thank you so much to Merlin Entertainment & Blackpool Pleasure Beach for a fab day out. ***Please note although expenses & tickets were covered, this is not a sponsored post.